Pennsylvania’s lieutenant governor stopped in Butler County on Thursday night to listen to residents’ thoughts on whether or not recreational marijuana should be legalized. Slippery Rock University hosted Lt. Gov. 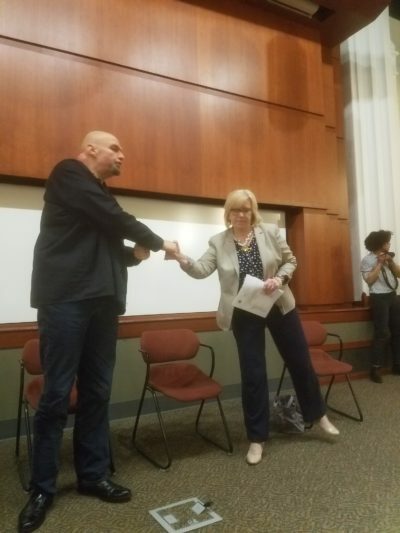 John Fetterman as he continues his pledge to visit all 67 counties in the state this year to find out what people have to say about the topic. Over 100 people attended Thursday’s forum and many spoke on both sides, but the majority appeared to favor legalization. Upon completion of the tour, Fetterman plans to present a report to Governor Tom Wolf and the citizens of the state for consideration. That report will contain information from and transcripts of all meetings on the tour, as well as comments submitted online. The post Lt. Gov. Hears Butler County Residents’ Thoughts On Recreational Marijuana appeared first on ButlerRadio.com – Butler, PA .